A gift from me to you: Discounts and special offers galore! To celebrate the momentous (for me at least!) occasion of my blog achieving its 100,000 view, I decided I would like to prepare something special for readers, as a way of a thank you, and also to involve the local community. 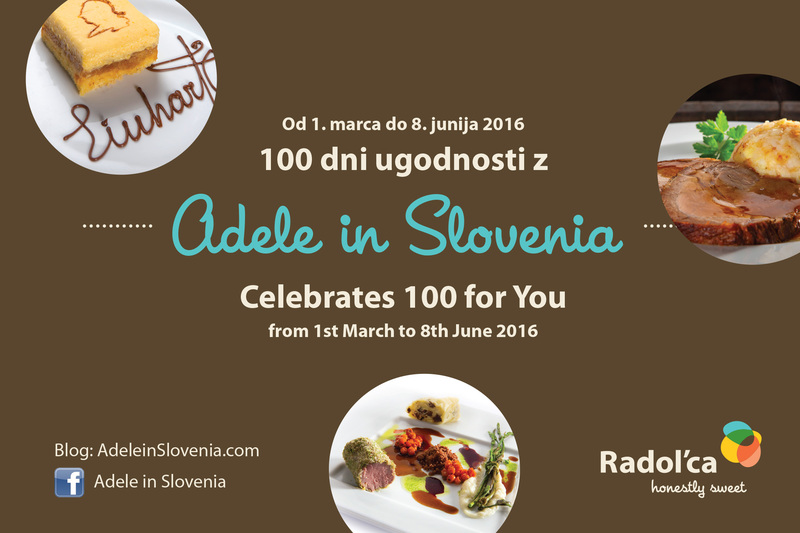 Therefore, I came up with an idea and am now immensely proud and excited to introduce and offer you the ‘Adele in Slovenia Discount Card’. The card offers a range of benefits that EVERYONE can take advantage of, regardless of whether you live in Slovenia, or are visiting as a tourist, and even better it’s FREE! As it is a celebration of achieving 100,000 views the special offers will last 100 days – commencing 1st March, ending on 8th June. I pitched the idea to the director of Tourism Radovljica, who liked the idea and agreed to help with printing the cards, and I then set about contacting each of the Taste Radol’ca restaurants, and a few other local companies, all of whom were enthusiastic and generously offered a variety of discounts, special offers, freebies and more. Here’s the deal. Simply pop into the Radovljica Tourist Office (opening hours – daily 9am – 4pm), where you can take advantage of the first special offer, and pick up your card. There are no strings attached, anyone can get a card, and it can be used unlimited times during the 100 day period. So, don’t delay, go and pick up your card today (well tomorrow, from 1st March they are available)! Here’s to the next 100,000 views….. I hope you will remain with me for the journey – there’s still plenty more to come!